1. September 13th was International Chocolate Day, so proclaimed by the National Confectioners Association. It's like a Hallmark holiday, only tastier. Celebrated by consuming some chocolate with a soul, per usual. 2. The U.S. Government shutdown last Monday evening. OK, maybe I didn't miss this one, and maybe it's not directly food related. However, it is worth noting the absurd childishness of our government, the expansive economic repercussions this might have (even for those of us living abroad...damn exchange rate), and makes me more inclined to pretend I don't speak English. "Mi dispiace, ma non parlo inglese..." But in all seriousness, there are a few key points on how this affects food and the environment: 1) National Park Service is furloughed, which means the parks close as does their management; 2) while food stamps and subsidized school lunches remain unaffected, the support program for pregnant women, new mothers, and children (hovering at around 9 million) up to five will receive no more funding; 3) the Food and Drug Administration (AKA FDA) has halted most of its food inspection; and 4) and finally, lack of data on crop production from USDA could impact the normal international trade procedures and crop price development, ultimately impacting food prices around the world (yay for a globalized economy)! 4. Finally, National Kale Day was last Wednesday. 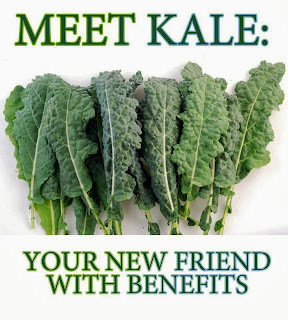 I love kale (reminder to self to add to shopping list...). It is delicious, versatile, and healthy. There can never be too much love for leafy greens. So, in case you missed it, feel free to celebrate...every day.